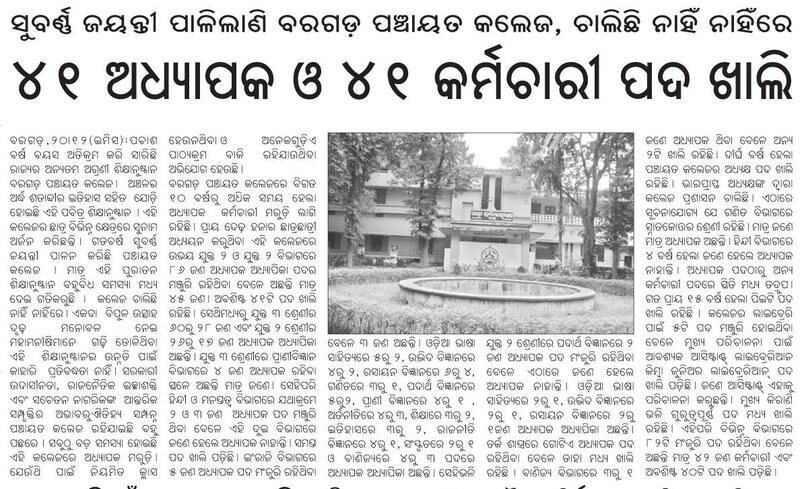 Like any other college of western Odisha, the only Government college of Bargarh district, Panchayat College, located at Bargarh district headquarters town, also suffers from staff shortage leading to fall in education standard. There are a few departments which run without teachers. The college has got 60 and 26 sanctioned posts in various departments for +3 and +2 wings, respectively, having Arts, Science and Commerce streams. But only 25 lecturers in +3 and 17 lecturers in +2 classes are available now and the rest of the posts are lying vacant since long in spite of repeated request from the students, guardians and senior citizens to fill them up, sources said. This has also led to students’ agitations in the past. At the same time, the college doesn’t have a permanent principal of its own over a decade now. Situation is more precarious in important departments like Physics, Chemistry, Mathematics, Zoology and English. The departments of Mathematics and Zoology have got one teacher each, college sources confirmed. Situation for the non-teaching staff is also in no way better. Out of total 82 non-teaching staff, 41 remain vacant — exactly 50 per cent of the strength. “Not only have I requested the Higher Education Minister and the Secretary a number of times to fill up these posts with immediate effect, I have also raised the issue in the floor of the Assembly, but to no effect,” said MLA of Bargarh Sadhu Charan Nepak. This shows the attitude of the Government to the problems of the students and higher education as a whole in this backward region, Nepak alleged. “I am also well aware of the problem in this only Government college of the district. But my hands are also tight. I can only ventilate the sentiment of the people to the Government,” said Bargarh District Collector BG Mishra. Bhubaneswar, Sep 5 – Orissa, which has the second highest tribal population in the country, will start high-tech coaching progammes from next month exclusively for its tribal students to help them compete in tough competitive examinations.The state government plans to enroll about 1,000-1,500 students of Class 10 and 11 from 19 state-run tribal schools located in the interior areas for the programme. Sanjeev K. Chadha, director of the state Scheduled Caste and Scheduled Tribe Welfare Department, said tribal students who are not enrolled in tribal schools would also be given the training later. ‘Two special classrooms would be set up in government-run higher secondary tribal schools as most of the schools are primarily residential. The schools will be equipped with computers, projectors and liquid crystal display (LCD) boards,’ Chadha told IANS. Students will be provided around 300 hours of coaching by high-quality teachers and instructors, physically or through online and video conferencing. The programme will cost about Rs.3 crore every year, Chadha said, adding that the coaching sessions will include in-depth coverage of all the concepts of physics, chemistry and mathematics. The project will help students to look beyond industrial training institutes and encourage them to appear in competitive examinations. The students would be prepared for examinations like the All India Engineering Entrance Examination, (AIEEE), Orissa Joint Entrance Examination (OJEE) and the Indian Institute of Technology-Joint Entrance Examination (IIT-JEE), he said. ‘We have already issued a tender to find out a good engineering coaching institute that would provide us the study material. We are likely to finalise this within the next few days,’ he said. ‘Since the Classes 10 and 11 are located mostly in interior areas and primarily residential, satellite technology will be used to train the students,’ said Chadha. Orissa has the second biggest tribal population in the country. The state has a population of over 36 million, of which more than eight million are tribals, according to the 2001 census. The Scheduled Tribe population is 22.13 percent of the state’s total population. The percentage of literacy among the Scheduled Tribes is 37.37 against the general literacy level of 63.8 percent . When it comes to functional literacy, the percentage is even lower. The SC/ST Welfare Department will identify students who have the necessary academic background and basic ideas of Class 10-level physics, chemistry and mathematics, he said. The department will assess the instructors for each school, a minimum of one instructor each for physics, chemistry and mathematics, he said. The instructors will be assessed for their ability to facilitate classroom coaching and clear the doubts of students on the subjects, he said. Enhanced scholarship for Orissa’s students; Is this enough? BHUBANESWAR: The State Government has decided to enhance scholarships for college students and those pursuing technical courses. A decision to this effect was taken at a high-level meeting presided by Chief Minister Naveen Patnaik here today. Plus Two, degree, post-graduate, engineering, medical, dental, agriculture and veterinary students will be eligible for the enhanced scholarships. It was also decided that more students will be given scholarships from the current academic year. The junior merit scholarship for the Plus Two students has been increased from ` 40 to ` 300 per month. Senior merit scholarship for degree students has been hiked from ` 50 to ` 500 per month. The PG merit scholarship will be ` 1000 per month. This has been enhanced from ` 60. The scholarship for students pursuing engineering, medical, dental and other technical studies will be ` 10,000 per year. The income limit of the parents for availing the scholarship for their wards has been enhanced to ` 4.5 lakh per year from ` 24,000. Interested students can apply for the scholarship to the Higher Education Department through their respective colleges. While 5000 students will be given the scholarship at the Plus Two level, this will benefit 1000 students at the degree level. At PG level, the scholarship will be given to 500 students. Besides, 10,000 students from different technical courses will be extended the scholarship. The Chief Minister underscored the need for creating awareness among the students about the new scholarship structure. He said the students should get the scholarship amount at the right time. Higher Education Minister Debi Prasad Mishra, Bijay Kumar Patnaik, Principal Secretary to the Chief Minister, Additional Development Commissioner Rabinarayan Senapati, Principal Secretary in the Finance Department Jugal Kishore Mohapatra, Secretary, Higher Education Department, Madhusudan Padhi, and senior officials were present. The Government of India’s National Sample Survey Organization (NSSO) in a report has released the well-being index of India. The same tell about the quality of life in India. 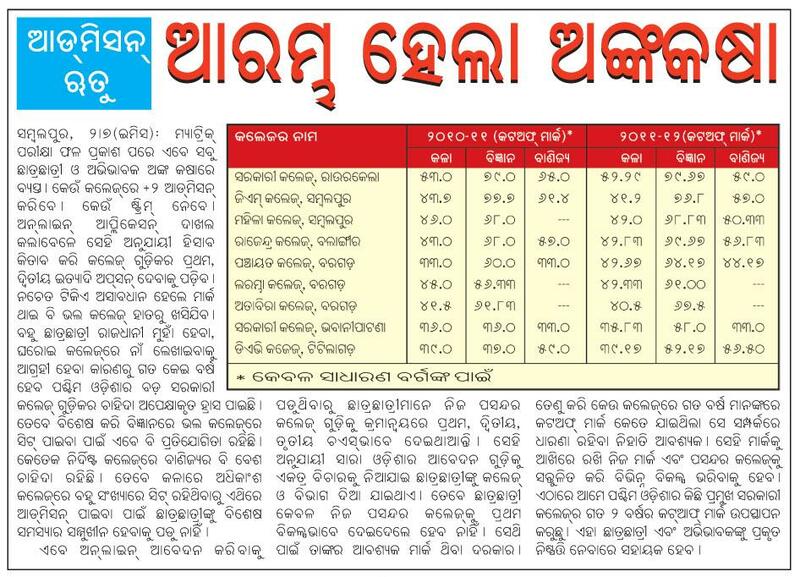 This report has mentioned that six districts of Orissa being in the list of worst twenty districts of India. 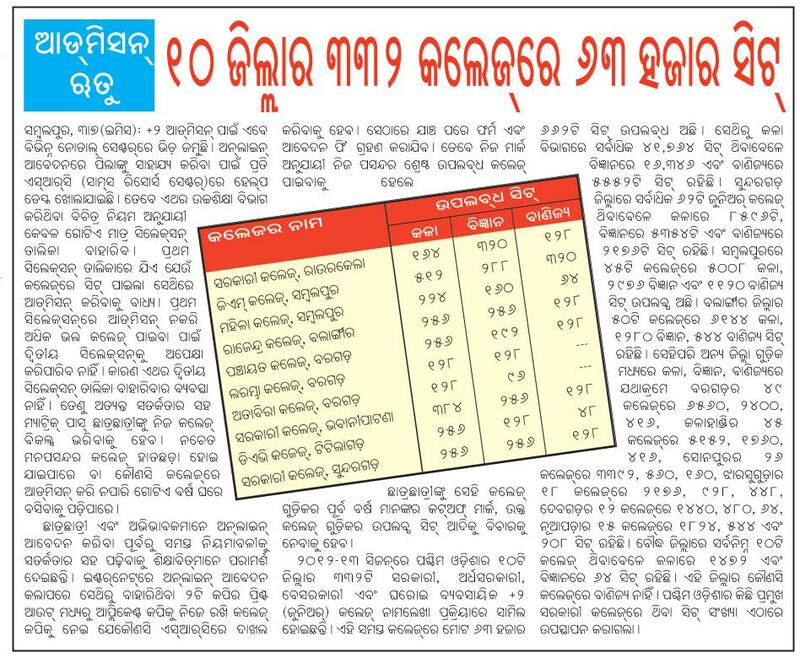 Rayagada district ranks the worst in India followed by Kandhamal, Nuapada, Bolangir, Koraput and Bargarh, all in Western and Southern part of the state, are ranked at 4,9,10 & 19 from the bottom respectively. Orissa, one of the poorest of states in the Indian union, is inhabited by more than 24% of tribal population concentrated mostly in North-Western, Western and Southern part of the state. Due to the negligence of all successive state governments, the development of these three patches are far behind the Coastal Orissa tract by any parameter even though these regions are full of minerals and natural resources. In two occasions, during 1936 and 1948, these tribal dominated Western and Southern regions amalgamated into then Orissa division (precisely the present Coastal Orissa) from erstwhile Central and Madras presidency of British ruled India respectively to form Orissa state in the line of linguistic similarities. But, reality is, till now the native people residing in these regions don’t know how to speak the state official language Odiya, which is practiced in Coastal Orissa districts in particular. Vast region of Western Orissa communicate in variants of Sambalpuri language (also termed as Kosli by some) and with numerous tribal languages practiced by the indigenous tribal population. This leads to poor enrolment in school which encourages Odiya as the medium of education and thus a high school dropout rate is seen in these regions. Students are forced to learn Odiya language in school which is different than what they practice in day to day life. The differentiation between the then Orissa Division (Coastal Orissa) and the newly added Western and Southern regions is well maintained by all successive state Governments, while allocating funds and in developmental works. Inhabited by app.50% of the state population (17,899,735 as per 2001 Census) and spread in 28.73% of total land of the state (44,355.4 Sq Km), this Coastal Orissa tract is given utmost priority by all the successive state governments and have been enjoying all sorts of developmental works in the name of Orissa. Where as a vast land with more than 71.27% of the total land area of Orissa state (109,992 Sq Km), and with a population of little above half of the state population is depriving basic needs. It is pity that present state government too, has done nothing to minimize the gap between the coastal and the rest of Orissa in its decade long rule; but increasing it by concentrating every developmental activity in and around the state capital Bhubaneswar. During this government’s tenure, all the national institutes for higher studies and research sanctioned by the central government are established or proposed to establish in and around Bhubaneswar. Due to this capital centric attitude, common masses refer the Chief Minister Nabin Pattnaik as the Mayor of Bhubaneswar Municipal Corporation than the CM of the state. In recent development except for the Central University, all the educational and research institutes of national repute, such as Indian Institute of Technology (IIT), All India Institute of Medical Science (AIIMS), National Institute of Science Education and Research (NISER), Indian Institute of Information Technology (IIIT), etc awarded by Central Government for the entire state are located in and around Bhubaneswar. This has brought a distinction for Bhubaneswar as the only city in India to have an IIT, AIIMS and NISER at one location. Central Government has also proposed to establish a National Innovative University (World Class), National Institute of Fashion Technology (NIFT), ESI Medical College and Hospital, Railway Medical College in Bhubaneswar, and another IIIT in Berhampur in Coastl Orissa, neglecting the rest state. If you consider the allotment of health facilities in the state the picture of disparities done towards the rest of the tribal regions of the state gets crystal clear. There is just one state run Medical College, viz, VSS Medical College & Hospital, Burla in Sambalpur for the entire Western Orissa, there are state run SCB Medical college in twin cities of Bhubaneswar – Cuttack , MKCG Medical College in Berhampur, a city just 179 Km from Bhubaneswar by Road and 165 Km by train. Mahandi Coal Field Ltd. (MCL), a subsidiary of Coal India Ltd, a Central Government entity which has operation in Western as well as Central Orissa, is too establishing a Medical College Hospital in Talcher Town, 150 Km from state Capital Bhubaneswar, with state government’s active persuasion. The defense dept has proposed to set up a medical college in Baleswar, another town in Coastal Orissa with a distance of 198 Km by Road from Bhubaneswar. State government has recently proposed to upgrade Capital Hospital in Bhubaneswar to a Medical College with a hoping budget of 32.5 Crores. It is also been proposed to set up Government. Medical College & Hospital in Baleswar where as the state government is trying to establish 3 Private Medical Colleges in backward tribal dominated Western Orissa in PPP mode since last 15 years through Western Orissa Development Council (WODC) with a financial grant of 5 Crores each. There is no progress seen in establishing these Medical colleges in these backward regions of Orissa. So, a question instantly arises in mind, “Why private Medical College & Hospital for poor tribal region of Western Orissa, who can’t afford a full meal a day and central and state funded Government. Medical Colleges & Hospitals for Coastal Orissa?” Is this not pure discrimination? Points to notice that Balangir, Kalahandi, in this back ward Western Orissa, many times have created news in national media for starvation deaths. Low-income people in these backward districts can hardly afford the cost of good health care even for their children who suffer from early death, under nutrition and anemia. As against the State figure of 65 infant deaths per 1000 life births, district like Kalahandi in the Western Orissa had 119 infant deaths. Prevalence of undernourishment among children is also high in these tribal dominating districts. The health situation is really gloomy if we look at maternal death rates. Women in these households work hard at home, in the fields, bear children and do not get the medical attention while giving birth to children. Occurrence of malaria remains a threat to the people in the tribal areas. As many as 158 blocks in tribal districts, which contribute 70 per cent of the malarial cases, suffer the worst. Sometimes outbreak of mysterious diseases in these regions takes a heavy toll of life. Poverty and deprivation leave very little money with people to spend on the treatment of diseases and illness. s at a distance of 400 Km from Jharsuguda and more than 450 Km from Lanjigarh. Hundreds of crores rupees received from central government in the name of KBK has become a source of exploitation for the state government. The head quarter of the KBK scheme is at the state capital Bhubaneswar, far away from the problems people are facing in their every day life. This century of exploitation by all successive state government since the formation of the state in 1936, towards these tribal pockets has forced them to shout for a separate state of Kosal comprising 11 districts and a sub-division of Western Orissa. Also, the Maoist guerillas are spreading in rest tribal districts in rapid speed taking advantage of this. These entire exploitation stories remind the colonial era and raise some fundamental questions about democratic rights in India.